As was the case throughout the presidential campaign, more Americans continue to oppose (62%) than favor (35%) building a wall along the entire U.S. border with Mexico. 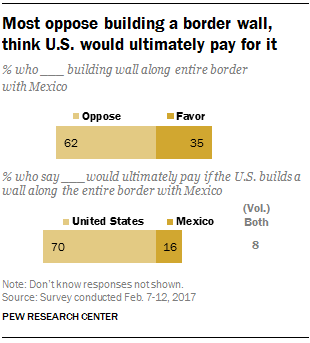 And while President Donald Trump has said the U.S. would make Mexico pay for the wall, the public is broadly skeptical: 70% think the U.S. would ultimately pay for the wall, compared with just 16% who think Mexico would pay for it. The proposal to build the wall was one of several contentious issues that loomed over a meeting between Secretary of State Rex Tillerson and Mexican officials this week to discuss immigration and border issues. The latest national survey by Pew Research Center, conducted Feb. 7-12, 2017 among 1,503 adults, finds the public holds mixed views on a border wall’s potential impact on illegal immigration. About three-in-ten (29%) think a wall along the entire border with Mexico would lead to a “major reduction” in illegal immigration into the U.S.; another 25% think it would result in a “minor reduction.” A 43% plurality thinks a border wall would not have much impact on illegal immigration into the U.S. Overall views of the border wall have changed little since last summer. As in the past, there are sharp differences in views across demographic and political groups. Overall, 46% of whites favor building a wall along the U.S. border with Mexico, while a similar share (52%) say they are opposed. By contrast, large majorities of blacks (86%) and Hispanics (83%) say they oppose building the wall. Opposition to the wall is widespread among young adults younger than 30. By 78% to 20%, more adults under 30 oppose than favor a wall. About two-thirds (65%) of those ages 30-49 also oppose a wall. Views among those ages 50 and older are more divided, with opposition narrowly outweighing support for a border wall. As in the past, partisan differences are stark. About three-quarters (74%) of Republicans and Republican-leaning independents support a border wall, while an even greater share of Democrats and Democratic leaners express opposition to building a wall across the entire U.S.-Mexico border (89%). Republicans are among the only demographic or political subgroups more supportive of a wall than they were during last summer’s presidential campaign. Support for a wall is up 11 percentage points among Republicans, from 63% in August, to 74% in the current survey. Eight-in-ten conservative Republicans favor building a wall, up 9 points since August. Support for the wall also has increased among moderate and liberal Republicans: In August, about as many favored (51%) as opposed (48%) the border wall. Today, a 60% majority of moderate and liberal Republicans favor building the wall, while 37% are opposed. Opposition to the wall among Democrats has been steady since last summer. Today, there is a modest 10-point difference between the share of liberal (94%) and conservative and moderate Democrats (84%) who oppose building the wall. A separate survey conducted late last year found that most Americans considered the building of the wall low among immigration policy goals. Just 39% regarded building the wall as very or somewhat important. The public’s highest immigration priorities were stricter policies preventing people from overstaying visas, preventing immigrants in the U.S. illegally from receiving government benefits, and allowing those who came to the U.S. as children to remain. The vast majority of Democrats (87%) say the U.S. would ultimately pay for a border wall, while just 6% say that Mexico would pay (4% volunteer that both would finance the project). Though Trump has said that Mexico would pay for the wall, rank-and-file Republicans are not so sure. Close to half of Republicans (46%) say that the U.S. would ultimately pay, while fewer (31%) think that Mexico would cover the cost; another 16% of Republicans volunteer that both the U.S. and Mexico would pay for a wall. Majorities across age groups anticipate that the U.S. would pay for a wall, including fully 81% of those under age 30. Nearly eight-in-ten Hispanics (78%) and blacks (77%) predict that the U.S. would ultimately bear the cost of a wall; 68% of whites also take this view. Conservative Republicans are about as likely to say that the U.S. would ultimately pay as to say that Mexico would finance the project (40% vs. 36%). By contrast, a majority of moderate and liberal Republicans (62%) anticipate that the U.S. would pay; far fewer (18%) say Mexico would bear the cost. Democrats of all ideological dispositions overwhelmingly anticipate that the U.S. would ultimately pay for a border wall. While Republicans are split over who would ultimately bear the cost of the wall, a wide majority thinks a border wall would lead to a reduction in illegal immigration into the U.S. Overall, 58% of Republicans and Republican leaners say that a wall along the entire U.S.-Mexico border will lead to a major reduction in illegal immigration; an additional 27% say it would lead to a minor reduction. Just 13% of Republicans think a border wall would not have much impact on illegal immigration. Conservative Republicans (65%) are more likely than moderate and liberal Republicans (44%) to say a border wall would lead to a major reduction in illegal immigration. Democrats have far less confidence that a border wall would curtail illegal immigration. 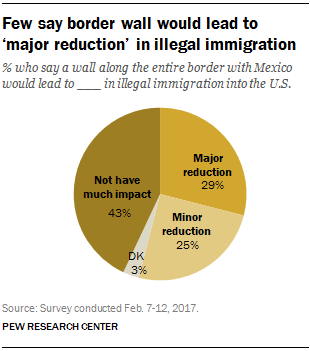 About two-thirds (65%) say a wall would not have much impact, compared with only about a third who say it would lead to either a major (9%) or minor (24%) reduction in illegal immigration. A wide majority of liberal Democrats (71%) say a wall would not have much impact; a somewhat smaller majority of conservative and moderate Democrats say the same (58%). A little more than half of blacks (57%) and Hispanics (55%) say that a wall would not have much impact on reducing illegal immigration. 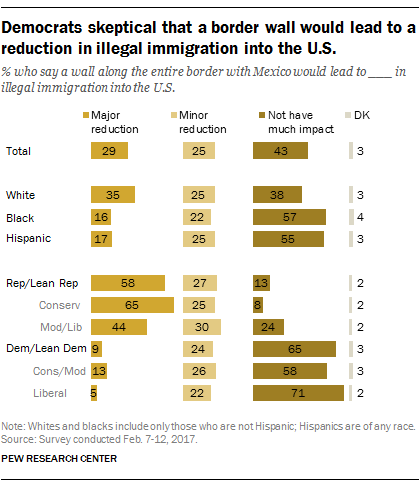 Among whites, views are mixed: 38% say a wall would not have much impact on illegal immigration, compared with 35% who anticipate a major reduction and 25% who anticipate a minor reduction. Note: See full topline results (PDF) and methodology here (PDF).